What to do on a sweltering Saturday in soon-to-be-October? Head out on a mini-excursion to feast our eyes on elongated editions of The Beatles, of course! It’s crazy that these 36-foot-dudes have been practically living in our city this whole time and we’d never heard about them before! 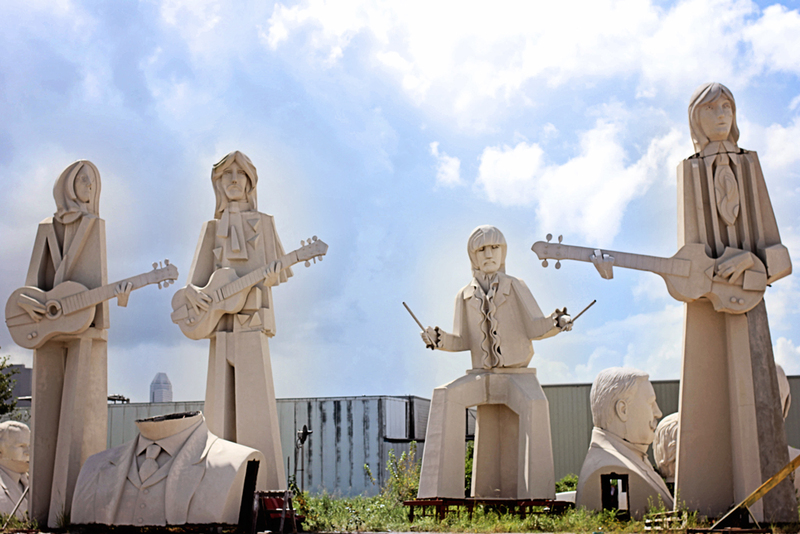 John, Paul, Ringo and George can be found in a semi-abandoned lot near the former studio of the great artist and Texas sculptor David Adickes, along with an ever-changing collection of president heads and busts he’s created throughout the years. Yes, it’s technically private property—but visitors are welcome to mosey and meander between Lincoln, Roosevelt, Clinton and oh so many more! Ah, art. Bold, bizarre, beautiful art. Adickes was born in Huntsville, Texas. After graduating from Sam Houston State University with degrees in both math and physics in 1948, Adickes went to the Kansas City Art Institute. He studied painting there, and then went to Paris where he studied art for two years. In 1957, he lived for a year in Japan and then traveled extensively over the next 10 years in the Far East, Mid East, Europe, Russia and North Africa. Yes, this is the same artist that created, “I LOVE HOUSTON” sign that I posted a couple of weeks ago, click here if you missed it. 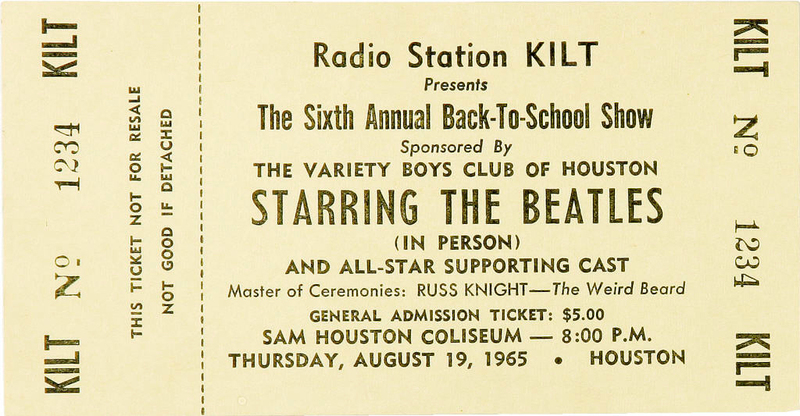 On Aug. 19, 1965, the Beatles played their only two concerts in Houston. They arrived at Houston International Airport — now Hobby Airport — at about 1 a.m. that Thursday amid the mass chaos of thousands of over-excited teenagers run amok. The spent a few hours at the Sheraton-Lincoln Hotel downtown and conducted a news conference there. Twist And Shout, She’s A Woman, I Feel Fine, Dizzy Miss Lizzy, Ticket To Ride, Everybody’s Trying To Be My Baby, Can’t Buy Me Love, Baby’s In Black, I Wanna Be Your Man, A Hard Day’s Night, Help and I’m Down. There are NOT enough words here on this blog, to describe what this girl would do, to go back in time and be there to see the Fab Four in 1965!!!! I’m sure it was a site to behold! Oh, George, John, Ringo and Paul…you will always have a piece of my heart! Well, I leave you with this…what was YOUR favorite Beatles song? Laurie, I’ve watched one of my brothers go crazy over the Beatles back in the 70’s and then one of my sons recently. I’ve enjoyed their music over the years but not as much as my son and brother have. Love the artwork—great photography. Such good-looking fellas! 🙂 I love the style of these sculptures, Laurie. Great captures! I’ll be singing the Beatles for the rest of the day now. She loves you, yeah, yeah, yeah…. Great tribute to the Fab Four. On that tour, the Houston scene was repeated wherever they went … and every city has been reliving those moments. For me, my favorite song may be Eleanor Rigby. how much fun!! I don’t really have a fav Beatles song, too many to choose from! What bold and amazing sculptures! Great shots. I love the song ‘Let it be’. So hard to choose one song, isn’t it? I just made the trip to Pittsburgh and back with one of the biggest Beatles fans that I know (so of course their music was on the ipod!). Such interesting art work you are finding! The artist’s comment about his legacy and having them be “very hard to move” made me chuckle! How cool! That’s a great legacy…thanks for sharing! Laurie, let’s do it. Return to that amazing time in our country and the world’s history. But to see the Beatles live “would be” the very best. 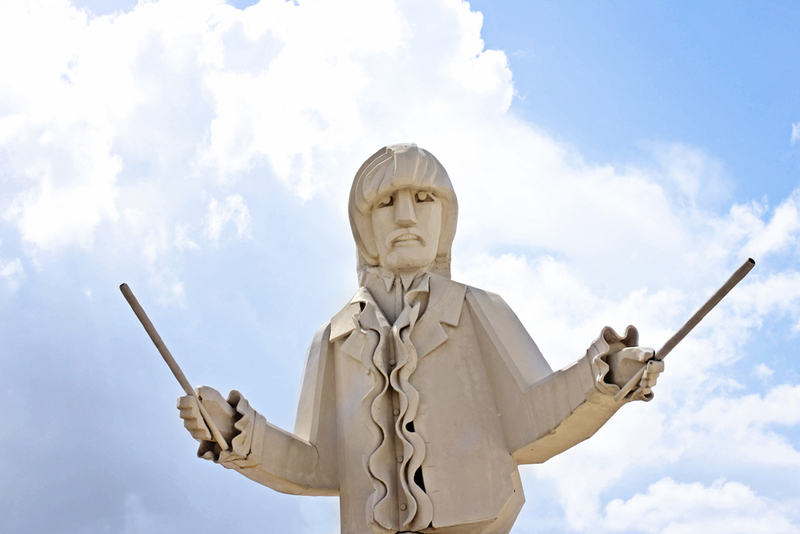 The sculptures are joyful interpretations of a musical group that changed future generations in so many ways. 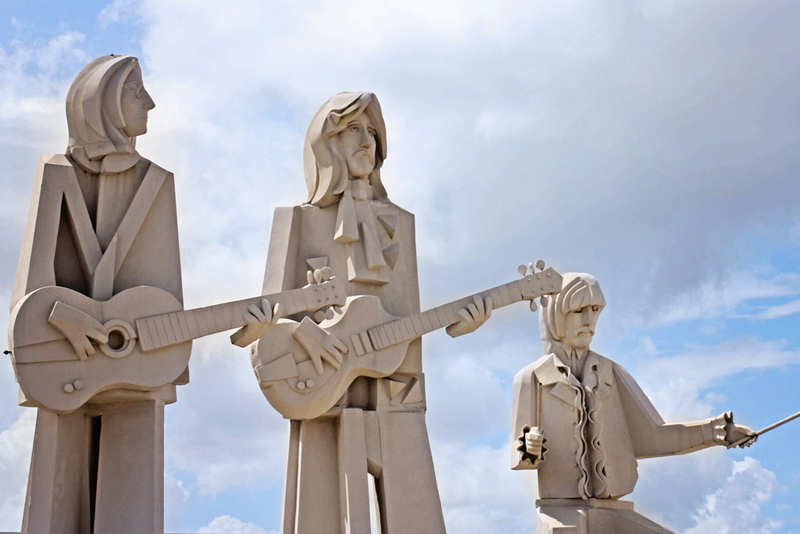 I love these statues of the Beatles. My favourite song would have to be Twist and Shout. I have many fond memories of dancing to it at family parties while I was growing up. 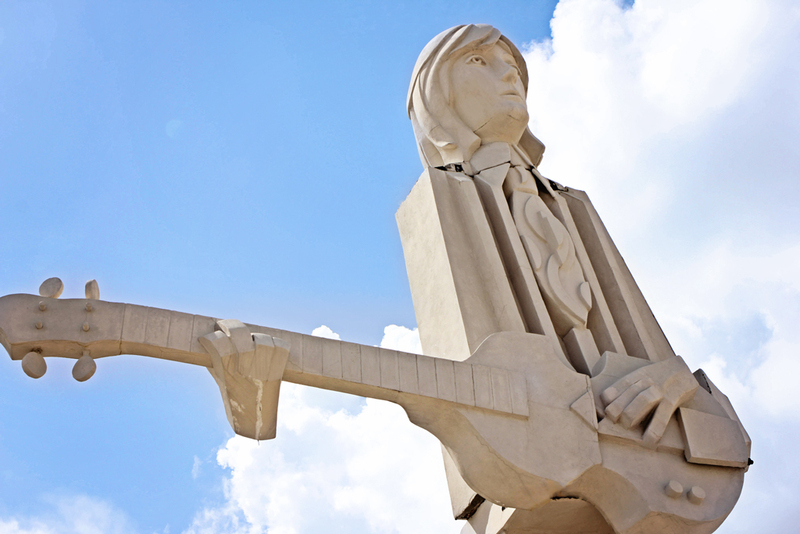 What wonderful sculptures representing an important piece of music history. I wouldn’t know where to begin with choosing a favourite Beatles’ song. I like them all. Great to hear The Beatles are back in Houston! I’ve been a fan for a long time, these elongated editions look great. Too many favourites to name just one. I adored the Beatles; particularly Paul. Thanks for sharing this story with us…very cool indeed! Lived in Houston for a year in the 60s… worked there off and on in the 80s… maybe it’s time for a return visit! I LOVE all things Beatles. I was 13 when they came to the US – so the perfect age to fall in love with them. There are too many of their songs I love to just name one – a few would be This Boy, Hey Jude, Twist and Shout, Yesterday, Blackbird, Two of Us and In My Life – the list goes on!!! !This is a great tribute to them – cool photos! Wow, this is awesome as are your photos…as usual. Have a fantastic weekend. What amazing works of art and so wonderfully captured. Have always been a big fan, don’t think I can choose one fave song…I have far too many! What an awesome tribute to the Beatles! Thanks for capturing it for us …. your images make is seem so real! I am so thankful for our artists!!! They are the ones who keep our stories fresh for generations yet to come. I am probably going to be “odd man out” here, but I never really cared for the Beatles. Has every single vinyl ever made by them. Love them and thank you for sharing. I wasn’t a big Beatles fan – I know hang my head in shame. 🙂 But, my eight-year old grandson loves the Beatles and plays all their music. This week he performed Paperback Writer at a local cafe. He’s definitely keeping their music legacy going strong. Judy, this is so very cool to hear your son is keeping their songs alive! Fantastic statues and love the detail in them. I would have to say my favorite song was ” Hey Jude”.